This Alexa skill wasn’t available for to test at the time of this writing, but Logitech’s press release indicated that Harmony Hub users would be able to choose from 270,000 devices to include in voice-activated Harmony Activities, as Logitech refers to its control scripts. In addition to TVs, set-top boxes, and A/V receivers, Logitech’s Hub can also control many smart-home devices, such as smart light bulbs, motorized window shades, and even smart entry locks. Harmony Activities are essentially scripts that you define to control the devices you’ve previously enrolled into the remote’s app. But when I say scripts, don’t think of programming or even services like IFTTT. When I reviewed the Harmony Elite remote control, I found this process to be extremely easy. The only tedious part is the first-time enrollment of all the devices you wish to control. The remote and the hub operate over Wi-Fi, so the Hub can be hidden away in a closet and you don’t need to point anything at it to get it to work. The Hub controls what devices it can over Wi-Fi, and it has two strong IR blasters, so that it can control any devices that don’t operate over Wi-Fi. 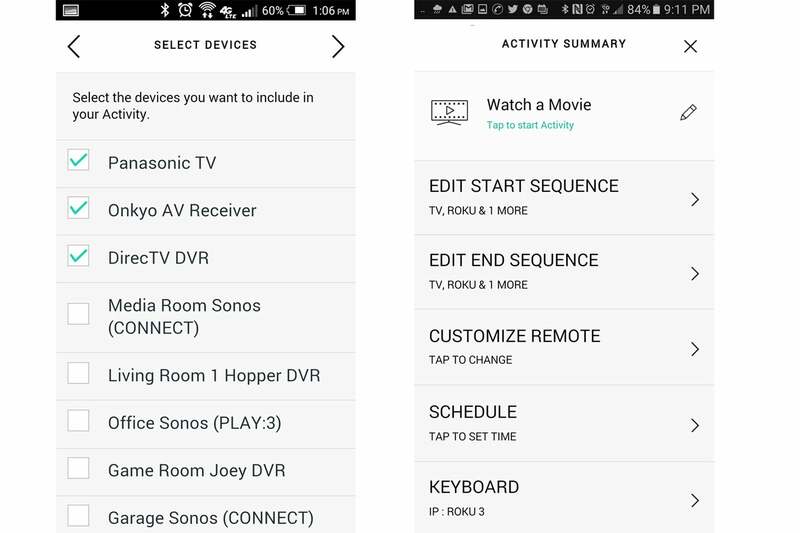 The first step in programming an "activity" in your Harmony remote is to enroll all the devices you want to control. The second step is to define the actions you need those devices to perform. Logitech’s press release provided a sample Harmony Activity in which you could say “Alexa, turn on my evening activity,” and Alexa would team with the Harmony Hub to turn on your TV, tune it to your favorite channel, bring down your motorized blinds, and dim your smart light bulbs, all at the same time. The key question for me personally is whether Logitech’s Harmony Alexa skill can interact with or trigger other Alexa skills. My home lighting controls, for example, are integrated into my Vivint smart-home system, which has a fairly robust set of Alexa skills. If I want to dim the lights in my home theater, for instance, I say “Alexa, dim the theater sconces to 60 percent” and these four lights—which are controlled by a Leviton Z-Wave dimmer—will dim to that percentage (or whatever value I say). I’d really like to have the lights dim along with the existing Harmony Activities I call “Watch TV” (which turns on my TV, A/V receiver, and DirecTV set-top box) and “Watch a movie” (which turns on the TV, A/V receiver, and Roku box). I suspect that won’t be the case, but I’ll update this story when I find out.